This property comprises of a large industrial building serving as a distribution centre with double storey offices on street frontage. The property borders onto the R24 highway and therefore enjoys good exposure. Good interlink and superlink reticulation is possible due to the fact that the property is situated on a corner. 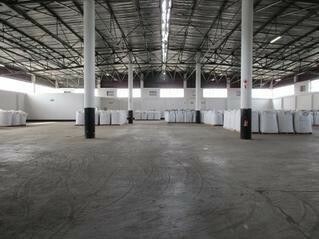 The warehouse is internally divided into three sections with inter-leading roller shutter doors. The floors in the warehouse are in a very good condition. All the offices are air-conditioned and fitted with good quality finishes throughout and comprises of various single and open plan offices together with board rooms, server room, kitchen and ablution facilities. The property is fully enclosed and has its own guard house for access control. If this property does not ideally suit you, please mail me with your exact requirements. I have many more Factories / Warehouses available in Elandsfontein, Henville, Isando, Jet Park, Pomona and the East Rand, which are not listed on the website.